But there is a necessary juxtaposition of Carnival and Lent. There can be no Carnival without Ash Wednesday and the significance of Ash Wednesday and Lent will be lost upon us, if life did not have its Carnival. All things have their season – there is a season for feasting, and a season for fasting. 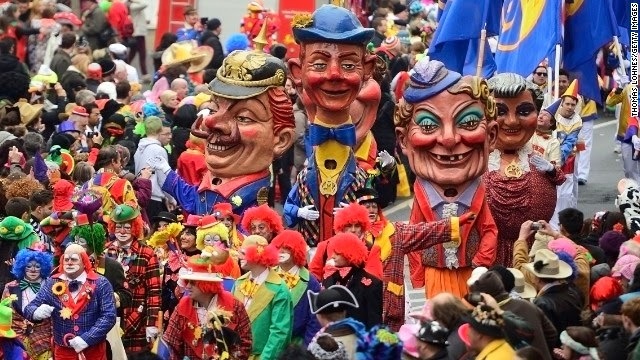 Carnival is indeed a time of physical and spiritual preparation for the Lenten time of self-denial. We had just concluded a Carnival of sorts – our Parish Feast Day and Novena. I jokingly commented to many that the celebrations of the past week had a been a kind of religious and spiritual Disneyland. But that time of feasting has ended. Now we must begin our fasting. This is the time when the Church invites us to reexamine and reorder all aspects of our life. We can see the contrast of Carnival indulgence and Lenten fasting not just in foods, but all areas of life. Carnival puts into perspective the things we need to give up in Lent. Our pre-Lenten celebrations and preparations provide us with a graphic illustration of the message of Lent, that we are fools, if we who seek our final end in earthly things! The Church, during this season of Lent, will show you where true happiness may be found, Who it is that brought it, and how He merited it for us. The pre-Lenten Carnival celebrations, despite their rollicking good fun and general merriment, really had a deadly serious objective. The “princes of this world,” in all their tinsely splendour, followed by a long train of personified human vices, sins and infirmities, solemnly enters the city gate and takes possession of the town. The performers are all arrayed in their costumes with the purpose of portraying Death, the World, Vanity, Beauty, Sin of every kind, human wealth, suffering, the joys and sorrows of human life, etc. This is not a triumphant procession of a victorious army. But a ridiculous motley crew of defeated individuals that are being subjected to mockery and humiliation. It is the procession of the defeated forces of the world, of sin, of vice and the Devil. It’s a parody of the triumphant procession of our true King, Christ, as he enters his City. Thus, the prayers and gospels of the season of Lent attempt to awaken us to a profound realisation of the fact that only through penance and through uncompromising rejection of sin, that is, through a thorough change of heart, can we partake of the redemption of Christ. Through His incarnation, His passion and death, Christ gained for us the graces of salvation without any merit on our part. But only a heart freed from sin and evil inclinations can become the field producing fruit fifty and a hundred-fold for the divine Sower. Whoever refuses to toil at purifying his sin-laden heart will of necessity remain in fatal darkness, and the light of salvation and grace will not reach him. After the feasting that ended yesterday, let us now begin our fasting. And after the long winter of fasting from the pleasures and delights of the world, we will be guaranteed a rich harvest of spiritual fruits that comes with a springtime of the Soul.